Welcome to Kicks and Giggles HD. We are the newest ultrasound studio in the area with the absolute best imaging quality available. We use a new HD machine instead of the old 4D technology. 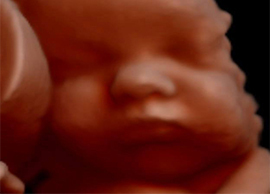 With this we are able to get extremely realistic images of your unborn baby and can even change the light source for the images to get many different views. You will also find our picture and video services a cut above the competition. We provide the color pictures and videos on an easy to use USB instead of an old CD rom. We are also very generous on both color and black and white prints. This studio is large enough for all of your friends and family to join in comfort and see everything on our big screen tv. The staff is always friendly and you won’t have to wait so long like you do at many other studios. Our goal is your complete satisfaction. Come on in and be prepared to feel a whole new experience as you meet your baby before it’s born. You will definitely love it and our prices open the door to anyone! See you soon!